* Check out my clients on my company’s website; FvSmedia.com/clients. I deleted a good amount of fake Facebook profiles for Jerry Hsu and Kevin ‘Spanky’ Long, as they didn’t want a presence on Facebook. 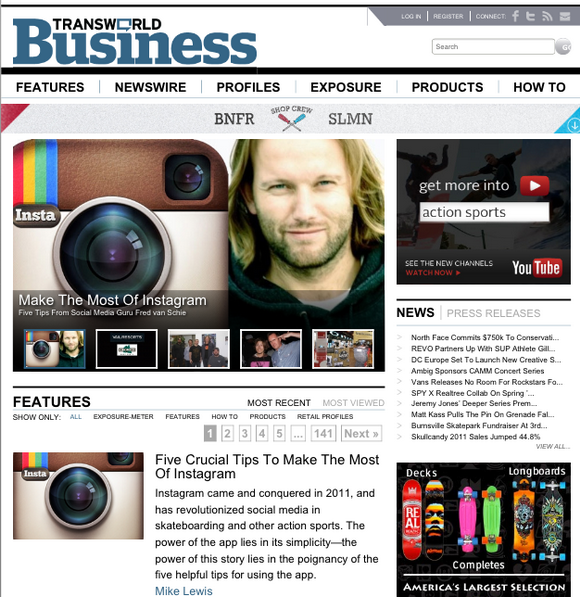 My first article for Transworld Business. Five instagram tips. Post got over 8500 views in the first 48 hours, and 14,000 views (total) in the first week. Thanks to Mike Lewis for giving me this chance! 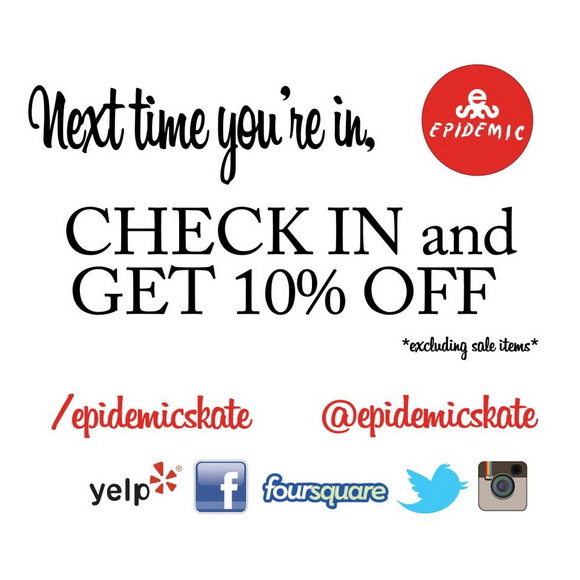 Talked to Epidemic skateshop owner Glen Coy after I saw he had a 10% discount on Yelp when people checked in. I advised him to get the other social media platforms involved. They made this flyer and started promoting this on February 14th 2012. In the first 10 days over 100 people checked in on Facebook (from there mobile device). Big thanks to Glen and the rest of the Epidemic for their trust and support! Giveaways are always good to get interaction going. It’s even better if you get others involved too. They will help you promote it and it will make the price package that much more interesting. 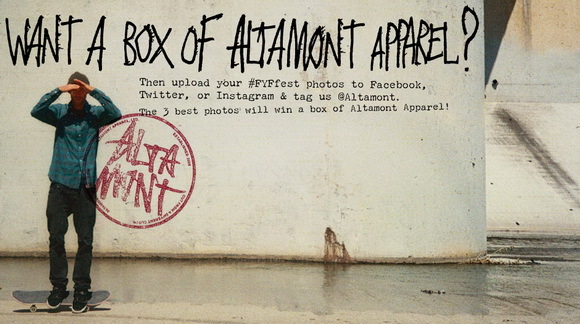 This particular Altamont giveaway had 3 fat boxes with each $750 worth of product. Interaction with your fans (and consumers) on social media creates an emotional connection, and that will drive sales. I came up with this idea for the 2011 FYF Fest in Los Angeles, CA. For the 4th time Altamont was the presenting sponsor. and the festival got 25,000 visitors this time. 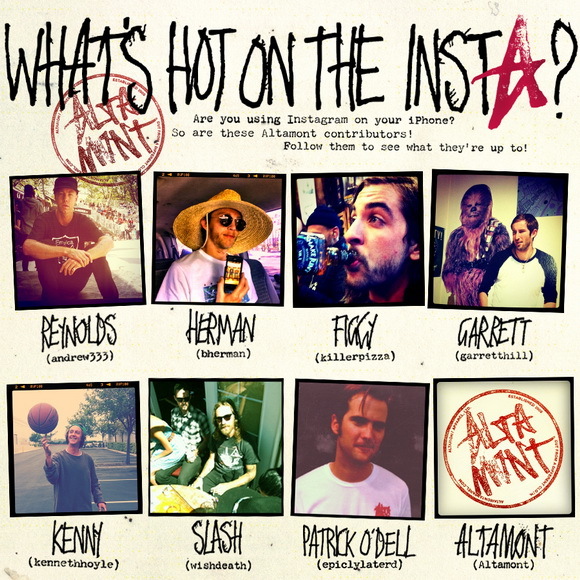 A lot of them are into music, art and skateboarding but might haven’t heard of Altamont yet. So while they’re uploading photos onto their own social media accounts (during the festival), I wanted to get involved with Altamont. A few weeks after Patrick O’Dell picked 3 winners. Best part about this all? Altamont gained a good amount of followers on Facebook, Twitter and Instagram that actively started to help promote the brand. Not only did they become a fan of the brand, but also a consumer and an ambassador of the brand. The ROI of social media, right here! I helped organize the éS Tri-X trip that went through the northwest of the USA in July 2011. I communicated with all the shops, made sure they got the posters and promo products, posted it on their social media sites. I drove one of the vans part-time and picked up (and dropped off) various riders at different airports. 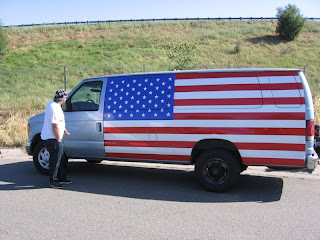 At the end of the tour I drove Joe Brook’s infamous big blue van back from Seattle to SF. Skateboard photographer and all around good guy Joe Brook went along on the Tri-X trip to shoot photos for a Thrasher article. Right when the tour started his collaboration shoe with éS Square Two shoe came out, and we did to photo shows to promote this collaboration. 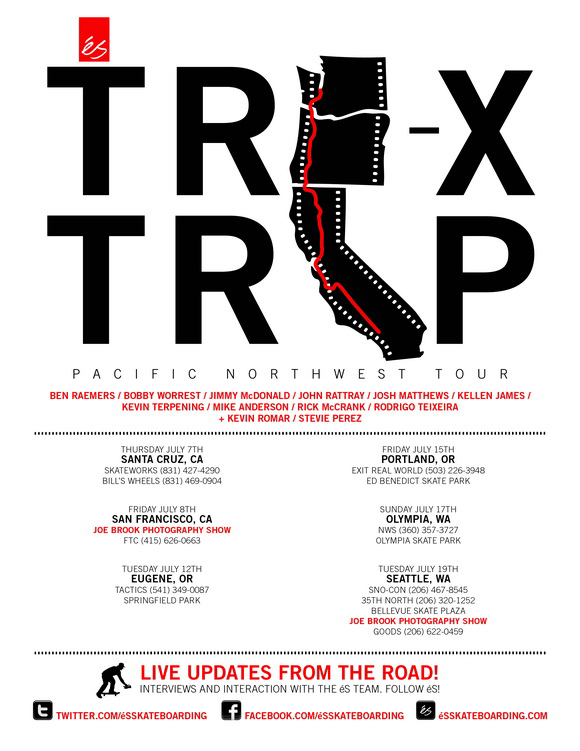 I worked with both shops, FTC in SF and Goods in Seattle, to set things up and promote the shows. Both shows got a decent amount of people. The whole tour and the 2 art shows were executed by the éS brand team. I was just a piece of the puzzle. Major props to Scuba Steve (TM & filmer), Sebastian Palmer (brand manager), Rob White (art director), Mike Kubota (product manager), Brian Greer (sales manager) and Matt Roder (sales rep) for executing this with me. Telling the éS fans to keep an eye out for team updates on Facebook and Twitter during the Maloof Money Cup in New York City in June 2010. Having social media accounts is one thing, promoting them is the next step. Flyer made by éS art director Rob White. As a brand you should lead and not follow. Your fans will follow you wherever you go (within reason). And if you wait you’re late right? After a trip to Holland in late April where I was asking my homies daily “what’s hot on the Insta?” Altamont art director Tristan Ellis made this flyer. Square of course, otherwise it doesn’t fit right on Instagram. Pretty sure Altamont was the first brand in the action sports industry to promote their (and the contributors’) presence on Instagram. Never thought Instagram would blow up this big this quick! *Funny side note: Right when Tristan finalized the flyer Patrick O’Dell walked in and he joined Instagram right then. Just in time to be included on the flyer! 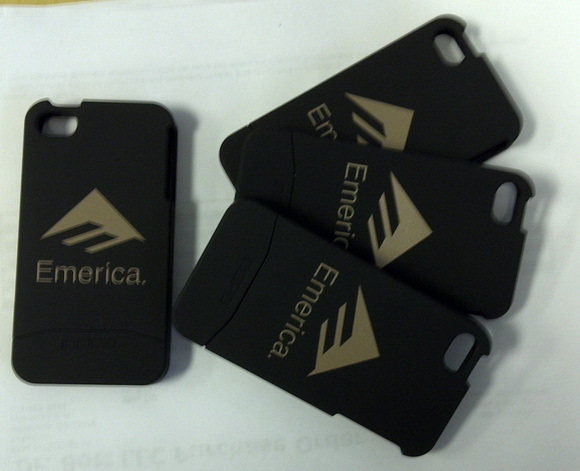 When most Emerica teamriders got an iPhone 4 I thought it would be cool to make some cases for them. My friend Mark Fitzgerald at Incipio was down and he made 20 EDGE cases. They have not yet made it in production (yet?). 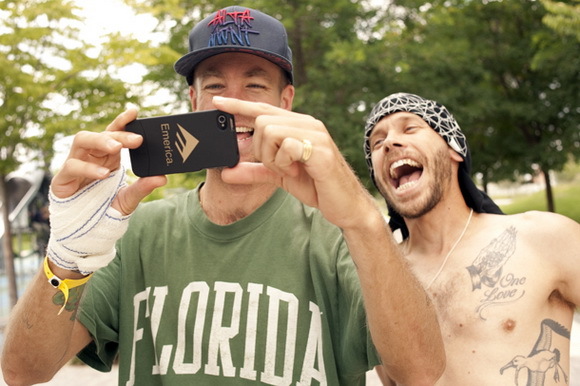 Andrew Reynolds and Shane Heyl watching homie footage during a Paris trip with the Goat. Photo is on the Thrasher website, taken by Burnout. 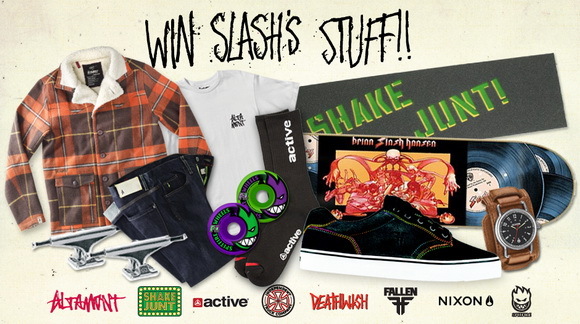 The future of photo incentive in skateboarding? 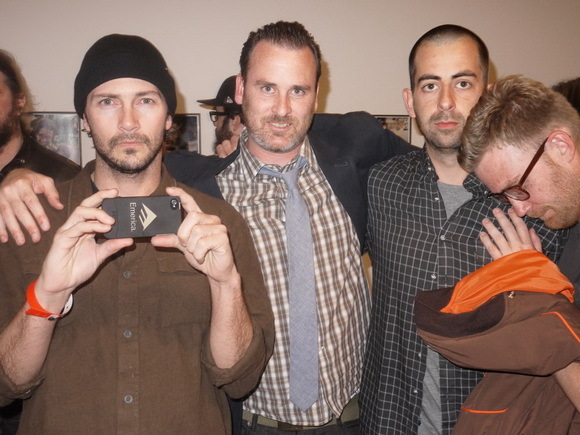 Heath Kirchart at the MOCA “Art in the Streets” opening, as seen on the Transworld Skateboarding website. Emerica X Hubba wheels Stay Gold collaboration for Brandon Westgate and Braydon Szafranski. Called up (then) Hubba wheels owner Tony Vitello in July 2010 to talk about getting some wheels for a giveaway on the Emerica site and ended up locking in this collaboration. Within a few days the graphic was all taken care off and the wheels went in production. One of the things I like about hard goods companies in skateboarding, they can act hella quick and get stuff in the market within a few weeks. With shoe and clothing companies the time frame is about 18 months. 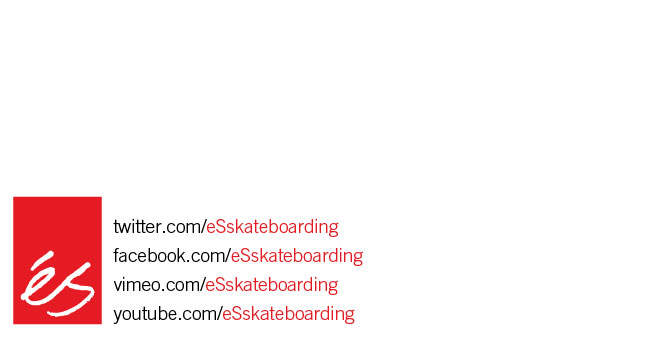 When I started working at Emerica in June 2010 I synced up all the social media platforms to the website. 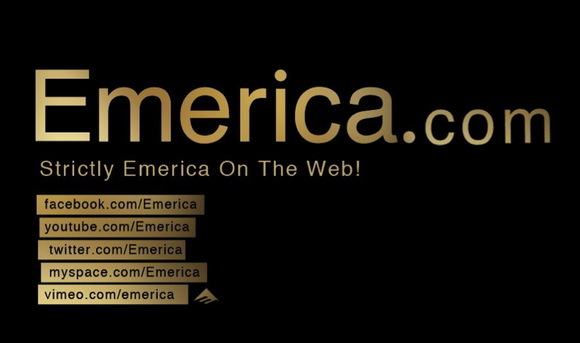 The web department helped me change the website URL over from Emericaskate.com to Emerica.com. 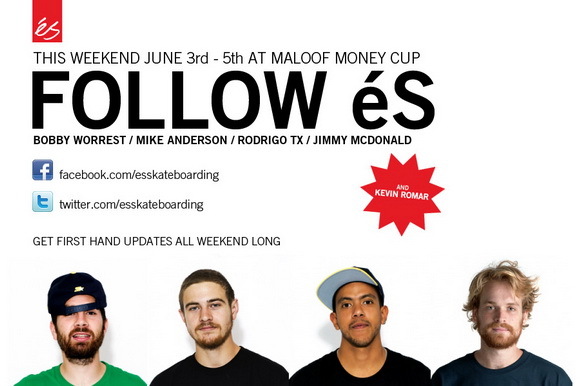 I updated the Emerica website and all social media platforms from June 2010 until May 2011. When I started working at Altamont Apparel in June 2010 I synced up all the social media platform URLs. 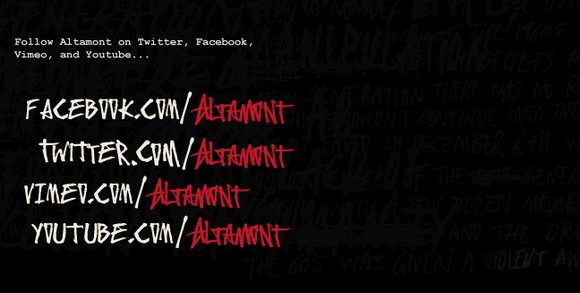 I updated the Altamont website and all social media platforms from June 2010 until December 2011. In June/July of 2010 I helped the people at éS synced up all their social media sites. I updated the éS website and all social media platforms from May 2011 until September 2011 when the brand went on a hiatus.